Be Known for Something : Discover Your Church Communication Thread / Communication Strategy / Now is the Time! Have you noticed how fast time flies? It seems like it was just summer and now it’s almost Christmas. 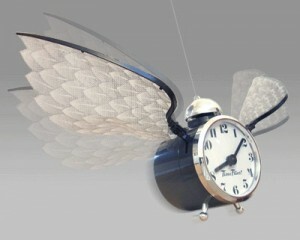 When I was a child, my Grandmother used to tell me how fast time flew. This was lost on my developing mind who thought that the summer months dragged by when I was often bored. Think about it, when was the last time you were bored? If you’re like me, I don’t even remember the last time. We’re told in the Bible that we have “seasons” — a time to do specific things and a time not to. Is this your season to do great things? I believe that God wants to do great things in the Church through you. And with the economy the way it is, and the uncertainty for the future, people NEED the church more than ever. Pray. Ask God to reveal to you some achievable yet challenging goals that He wants to empower you to do in 2010. Consider others. God creates relationships all around us and I fear that sadly the Church often leaves people (and their talents) out. God placed your congregation in your Church for a reason. Try to involve the most amount of people in your plans. It may seem harder, but it will ultimately be more fulfilling! Write it down. Many great plans are lost because people don’t write them down. In fact only 5% of people write their goals down — perhaps why so many folks drift through life! Be positive, in the present tense and be detailed. All of these components are important to make sure you stay on task. Be measurable. Why would you set goals if you didn’t have a way to measure if you succeeded or not? Make sure you tie a time line and a winning standard to each goal. Share it them with someone. A spouse, a friend, your congregation, your deacon board. Ask them to hold you accountable. Set checkpoint times in advance to get together and see how you’re doing. Start today. Break your goals into bite-sized chunks that you can start today. Then do it. Now. God is going to do great things through you this year. I’m excited about what He’s doing with me. The more organized you are in the tasks, the more you’ll get done. 2010 is going to be the best year ever!